For our wedding my Aunt Lynn gave us 2 awesome cookbooks. One was Artisan Bread in 5 Minutes a Day, and the other is The Professional Chef from the Culinary Institute of America. That, my friends, is ONE BEHEMOTH of a cookbook. We haven’t cooked out of it before today – mostly because it’s heavy and I have a hard time lifting it to look through. So it’s been sitting on a shelf for nearly 3 years – except when someone needs a homemade booster seat. Anyway, I was planning on making marinated chicken breasts for dinner tonight – using a fish taco marinade we really liked. Actually, what I’d had in my head ALL.DAY.LONG. was to slowly caramelize a ton of onions then bake chicken breasts that’d been marinating in some really good balsamic vinegar. I have no idea why I changed my mind. So I grabbed the hunka-munka cookbook, hoisted it up onto the table and leafed through it, looking for boneless, skinless chicken recipes. OH!!! I know why I grabbed it! I started off looking through…okay okay, DROOLING over Deb Perelman’s new cookbook, which happened to be stacked on top of the CIA cookbook. Her chicken recipe is breaded and then fried, and I wasn’t in the mood to sweep the floor up again, so I looked for a recipe NOT involving breading the cutlets. THAT’s why I grabbed it to look through! It just glistens, doesn’t it? Dinner tonight ended up being super duper simple: Cast Iron Skillet Fried Paillards of Chicken with Sun-Dried Tomato and Oregano Butter, served with steamed cabbage and a simple green salad. Translation: Boneless, skinless chicken cutlets sliced through completely so they’re in two pieces, then pounded flat. That’s a Paillard. If you say stuff in French it just sounds more delicious and elegant. The fancy-shmancy butter (or in this case, non-dairy margarine because we’re having a meat meal) is supposed to be ‘piped’ on top of the hot chicken so it melts and oozes into a delicious sauce. I used a spoon to …well, ladle it out. Still melted pretty. That’s what counts, right? 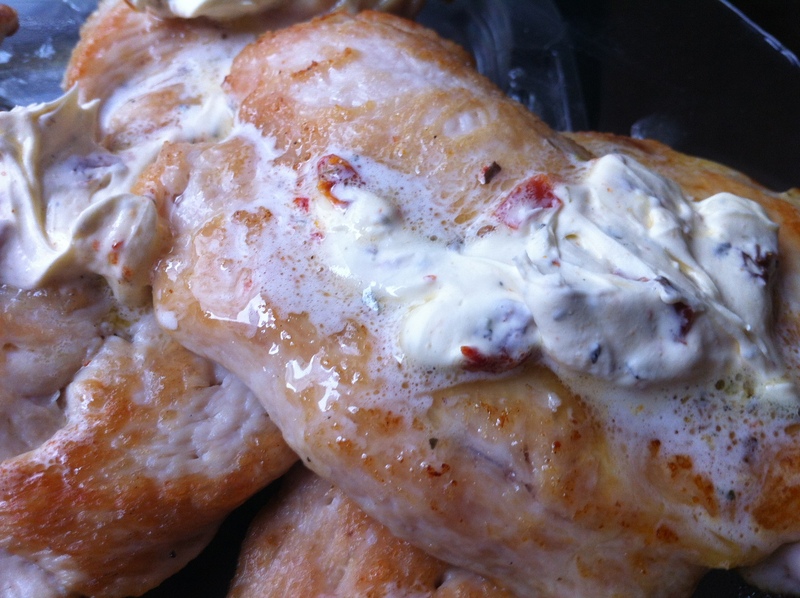 10 Boneless, Skinless Chicken Breasts **I had 5 on hand, but I actually only used 3. I trimmed the others but then decided to shove them in the freezer for another day. Oil for Frying **I used about 2 Tablespoons Olive Oil. 5 heaping teaspoons Sun-Dried Tomato and Oregano Butter **I used about 1 heaping teaspoon per paillard. RECIPE TO FOLLOW. 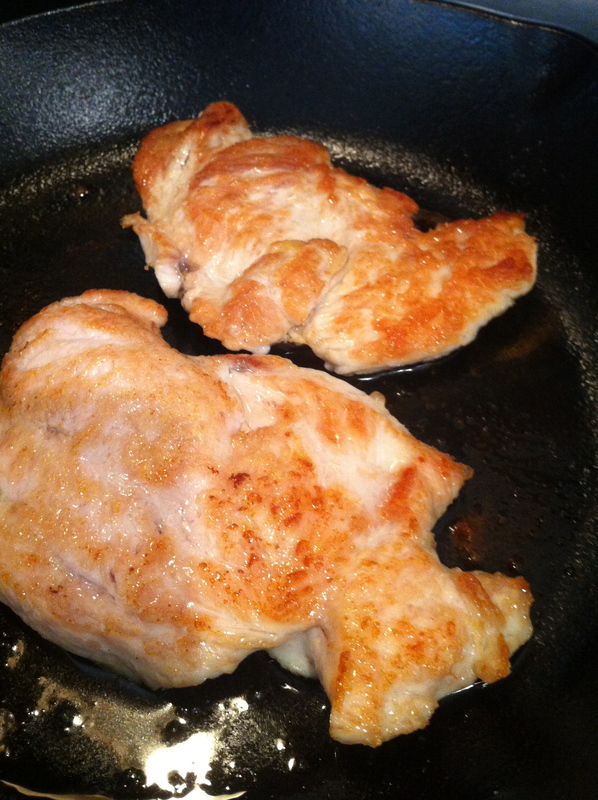 1- Trim and Pound the chicken into Paillards: Cutlets are typically cut across the grain and on the bias. I lay one hand flat on top of the cutlet, then with a sharp knife in the other hand, I slice through crosswise, making 2 pieces. Then you lay the pieces one at a time, in between plastic wrap or wax paper and whack them with a meat POUNDER – not tenderizer – until they’re the desired thinness. **Actually, I use a skillet to whack them. Or the bottom of a saucepan. Whatever is nearest. 2- Heat your skillet over medium-high heat and add your 1st Tablespoon of Oil. 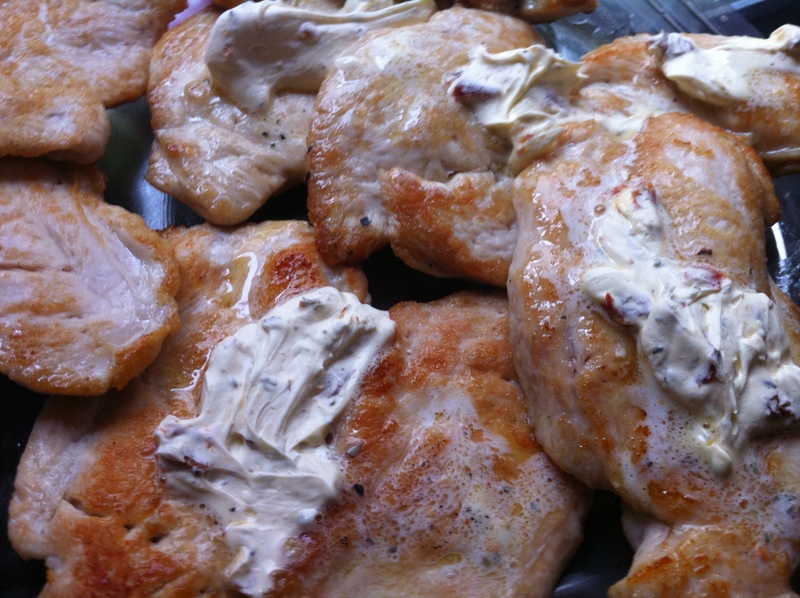 When it’s shimmering, add your cutlets/paillards in a single layer. Leave them to cook until lightly browned (3-5 minutes) before flipping over. I like them lightly crispy, but if you like them more crispy – cook them longer. 3- Remove to drain on paper towels, and continue cooking other cutlets. 4- Groan at the idea of cleaning up all the splattered oil. 5- Scoop/pipe the fancy-pants butter onto each cutlet and serve immediately. Licking your fingers is TOTALLY required. 1 pound butter **I used margarine. 1- Mix everything together, adding more salt and pepper to taste. 2- Roll into a fancy shmancy log wrapped in plastic wrap and throw it in the freezer for 20+ minutes, or be lazy like me and just put everything back in the container you scooped it out of and whack it back in the fridge til you’re ready to use it. BTW, the twins thought the chicken inedible. After much HEATED negotiation, I caved and gave them hot dogs. End Result: Both C & I really liked these. 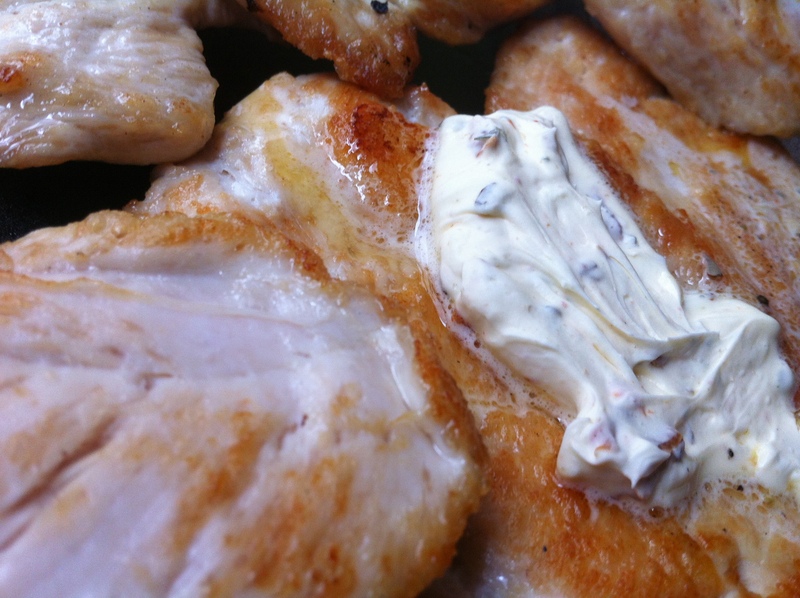 I’m already thinking up 17 more uses for this butter – but I’d rather not fry the chicken again. Maybe next time I’ll try baking it instead. I can still slather it with the butter. THAT sounds gooooooood! hmm oregano butter, sounds good, never had some, is it a homemade variety or store bought? I made it. Totally super-duper easy if you’ve the ingredients on hand! I love the Artisan Bread book! I bought myself a copy, and it’s sitting on my coffee table right now. I thumbed through and thought about trying their bagel and pretzel recipes. We’ll see if I get around to it! I’ve always wanted to try my hand at pretzels…and Naan and baguettes and croissants and parathas and sourdough. There are few things better in life than a hunk of good fresh bread, a bunch of grapes and a glass of wine! Oh my, if I could eat fresh bread and fresh fruit and dark chocolate every day for the rest of my life, I’d be the happiest girl alive. Especially if I could bake all the bread myself! I *knew* I liked you! Aww!! :] I’ll share half of my bread and chocolate and fruit with you every day!